Elevate your holiday pie game with this brûleed eggnog custard pie! Eggnog custard filling covered with a crunchy layer of brûléed sugar. 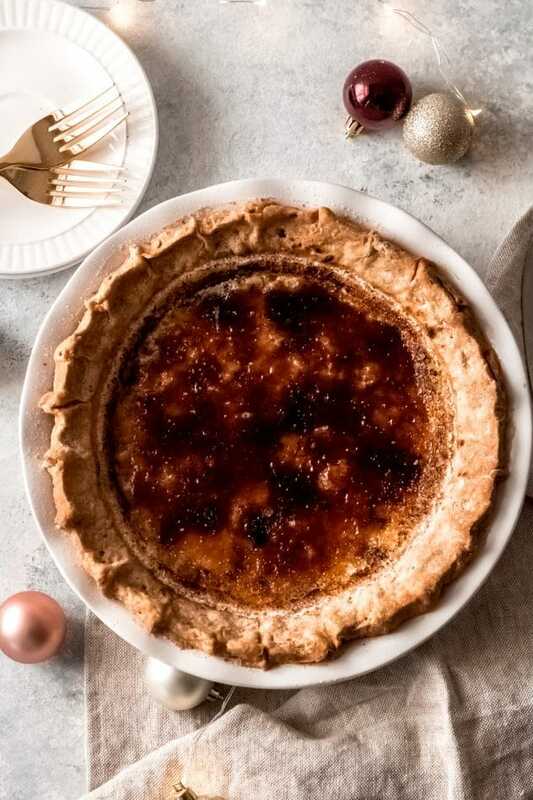 This brûléed eggnog custard pie is the perfect answer for elevating your holiday pie game, especially when you’re tired of the same old pies year after year. You get the full-on eggnog flavor within the custard pie, plus an added touch of sweetness with the brûléed top. What is a custard pie? 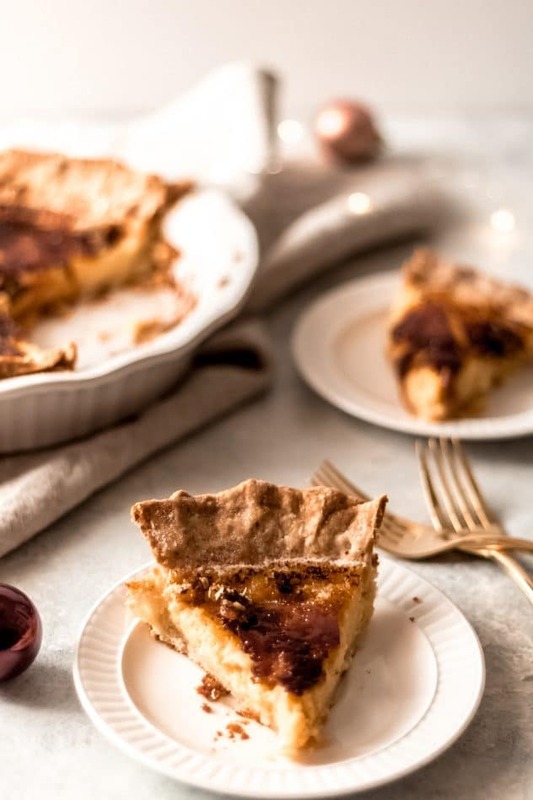 Custard pies are traditionally a simple pie made from a mixture of milk, eggs, salt, vanilla, and nutmeg. 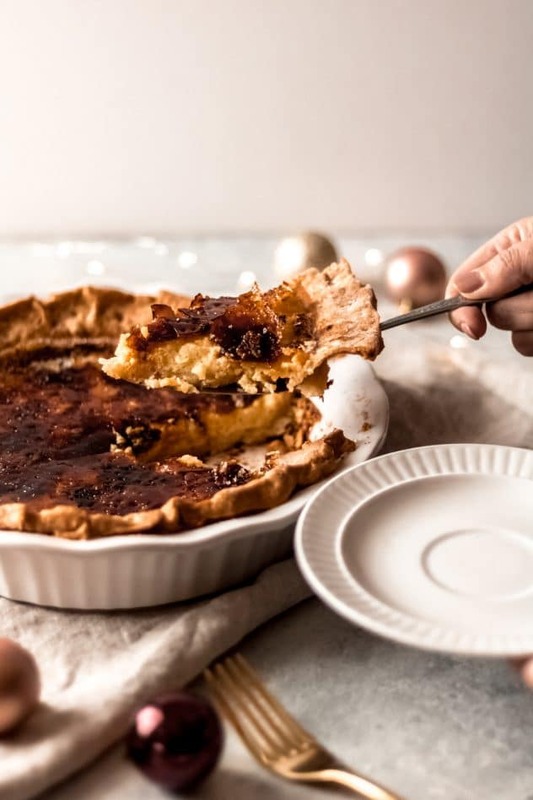 Custard pies are different than creme pies, where cream pies have more of a pudding-like texture and custard pies have more of a cooked egg texture. These flavors make it the perfect option for a holiday eggnog custard pie. 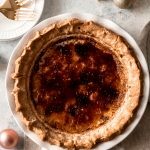 How do you brûlée a pie? Typical crème brûlée is a rich custard dessert that is topped with a hardened caramelized sugar top. So why not brûlée a pie, right? It’s fairly easy to brûlée any custard based pie given its similar characteristics to traditional crème brûlée. The brûlée step is the very last step after the pie has finished baking and cooled off just a bit. 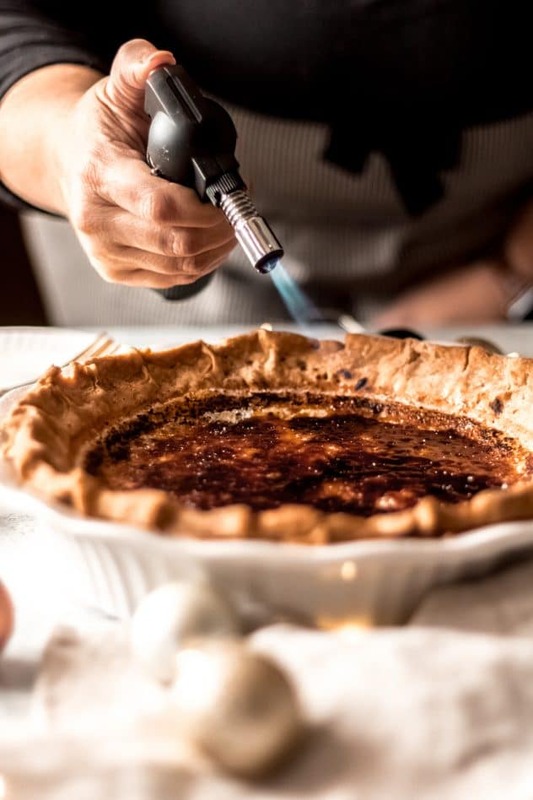 Simply add a layer of granulated white sugar to the top of the pie and caramelize the sugar using a kitchen torch. I would recommend using a kitchen torch rather than an oven broiler, which you can easily order from Amazon. How do you prepare a pie crust for a custard pie? We haven’t talked much about the eggnog part of this pie, but it is SPOT ON in terms of eggnog flavor! 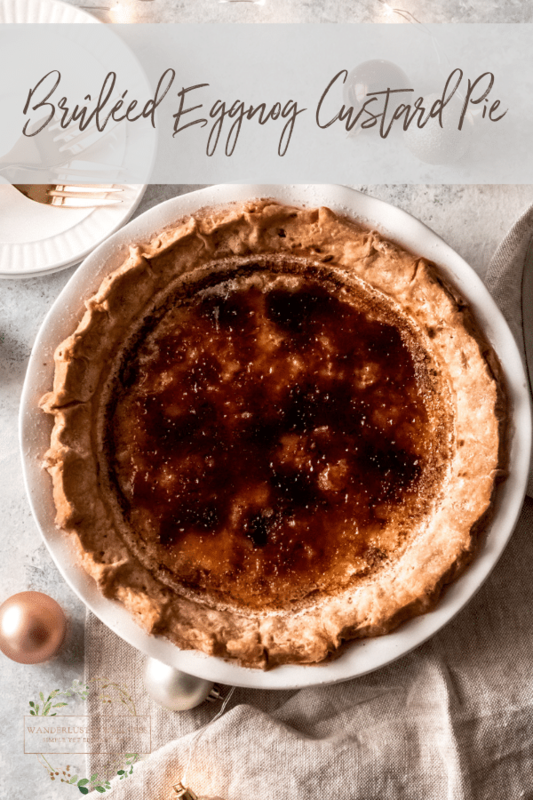 Enjoy elevating your homemade pie game this holiday season with this brûléed eggnog custard pie! Up your holiday pie game with this brûléed eggnog custard pie. Creamy eggnog custard center topped with a crunchy brûléed top. Preheat oven according to pie crust package directions. Roll out pie crust into a 14-inch round circle. Wrap the pie crust dough around a rolling pin and carefully unroll over a greased 9-inch pie plate. Gently fit the pie crust into the bottom and sides of the plate. Trim the extra dough to about a 1-inch overhang. Using your fingertips, crimp the dough all the way around the pie plate. Score (poke) the entire bottom of the pie crust with a fork, then bake according to package directions. While the crust is cooling, add the eggs, 3/4 cup sugar, eggnog, and vanilla to a large bowl and whisk to combine. Pour the filling into the pie crust and sprinkle the top with the nutmeg. Cover the edges of the pie crust with foil or a crust protector, but do not cover the pie filling. Bake for one hour or until set. Remove from oven and let cool on a cooling rack. Once cooled, refrigerate for at least 1 hour prior to serving. Just before serving, sprinkle the 4 tbsp. of white granulated sugar all over the top and, using a kitchen torch, brûlée until the sugar is caramelized and dark brown. Let sit for a few minutes and serve.